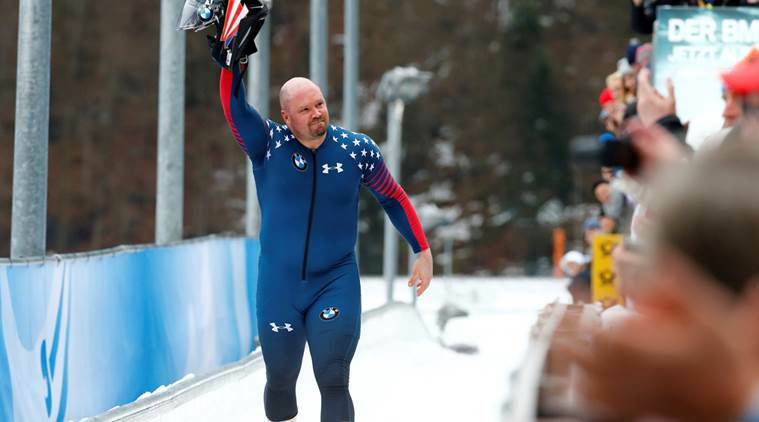 Steven Holcomb has been posthumously inducted into USA Bobsled and Skeleton Hall of Fame. Holcomb is the first person to have the Hall of Fame’s 10-year clause waived and he will be the only member of the sixth class of inductees. The Olympic champion was found dead in his room at the US Olympic Training Center in Lake Placid on May 7, aged just 37. A coroner’s investigation revealed he had sleeping pills and alcohol in his system when he died. In addition to the induction, Holcomb also earned this year’s men’s Bobsled Athlete of the Year award for his performance during the 2016-2017 season. He finished second overall in the two-man and third in the four-man International Bobsleigh and Skeleton Federation (IBSF) World Cups, which included winning five medals. Holcomb piloted the US four-man team to the Olympic title at Vancouver 2010, where he was joined by pushers Steve Mesler, Curtis Tomasevicz and Justin Olsen. Together they were known as the “Night Train”. Holcomb also won two-man and four-man bronze medals at the Sochi 2014, as well as five World Championship gold medals. He won six overall titles on the IBSF World Cup circuit, where he claimed 60 medals in all. A special memorial service to honor Holcomb took place at the Utah Olympic Park on June 10. His life was also celebrated at the Olympic Conference Center in Lake Placid in May while a minute of silence was held during the recent IBSF Congress in Salt Lake City.